Many of the Revere Family bells served a specific purpose. A ship's bell was used to indicate the time of day or a change of watch. Church bells announced a time to come to church and worship. Additionally, church bells were assigned the civic duty to announce the passing of a citizen of Boston. Ironically, the Revere Bell of 1816, in King's Chapel Boston, rang three times on May 10, 1818, to announce that a male citizen had died, and eighty-three times to announce the age of the deceased. 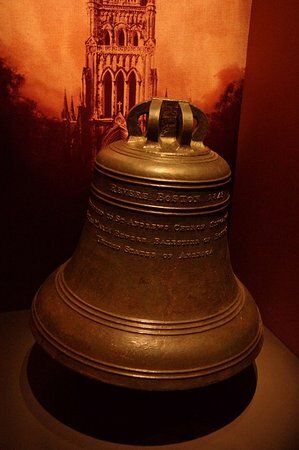 On this day this bell ,made and installed by Paul Revere, rang to announce his passing. Another bell, the Singapore Bell was ordered by Maria Revere Balestier to replace the British military cannon used to announce the beginning of curfew every evening at 8:00 p.m. Apparently, Singapore was a very dangerous place in 1843. Maria was Paul Revere's fifteenth of sixteen children. Paul Revere's first wife Sarah, died delivering Isannah, her eighth child. Poor Isannah died in infancy. Maria was carried by Rachel Revere, Paul's second wife. She married Joseph Balestier, making her the wife of America's first consul to Singapore. Maria, played a primary role in procuring the bell for the 1st Church of St. Andrews in 1843. The church was demolished in 1855, and replaced in 1861. In 1877 a medley of bells displaced the Revere Singapore bell. Captain J. S. H. Fraser was the donor. J.S.H. Fraser notably was the commander of the H.C.S. Marquis of Huntley in 1827 and frequented the port of Singapore on return from China and the final leg to London. In the British and American Navy, captain ranks higher than commander. The Huntley had its share of mutinies before Captain Fraser took the helm. His cargo in 1827, as you might have guessed, was tea. The Huntley resembles our most famous frigates and clearly had enough cannon to defend themselves. The H.C.S. suggests that she was an "Honorable Company Ship," modestly, distinguished from the British Navy. J.S.H Fraser would appear to be an employee of the East India Trading Company. His family established themselves in Singapore. At Fraser's initiative the British Royal Engineers stored the bell between 1877 and 1911. It was then donated to St. George's Garrison Church within the military barracks in Tanglin, Singapore. Soon after, the bell cracked. 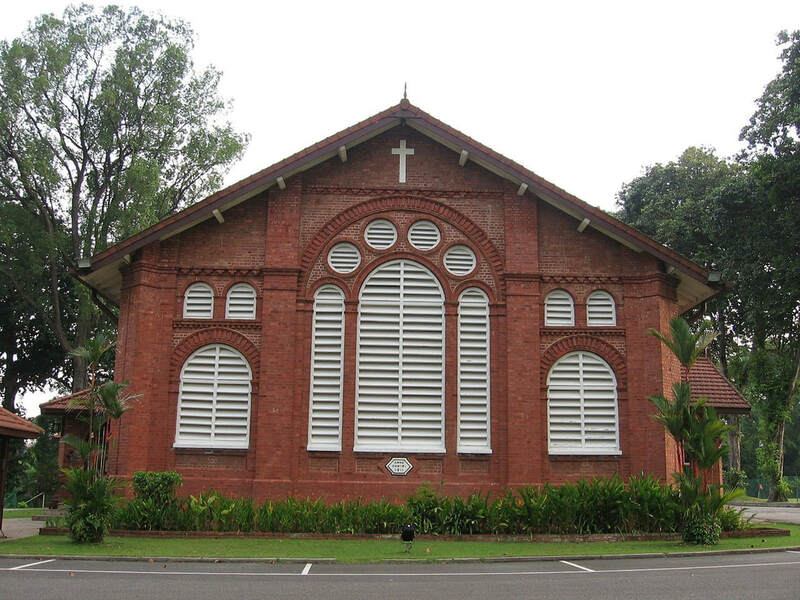 In 1937, The Anglican deacon donated the bell to the National Museum of Singapore. Survival of the many Revere Family Bells has often been tested by nature or history. The Singapore bell, was protected by the British Royal Engineers for years and managed to survive the occupation of Singapore by Japan from February 1942 to September 1945. During renovations of the Museum, from 1997 to 2006, the bell hung in the American Embassy in Singapore. Most of the dates above are modestly different depending on your source, including information from the U. S. Embassy. In the end, you can see and touch the bell today at the National Museum of Singapore. ​P.S. The inscription reads "Revere Boston 1843. Presented to St. Andrews Church, Singapore, by Mrs. Maria Revere Balestier of Boston United States of America." The bell is 32 by 35 inches; all references seem to avoid its weight, including the thorough review completed by Evelyn and Edward Stickney, of Bedford, Massachusetts, in 1976. Their pamphlet available at the Bedford Public Library is an excellent map of the Revere bells in existence. The King's Chapel Bell was the second largest bell cast by the Revere's and was 49 by 36 inches. By comparison, the Singapore Bell appears to be two-thirds the size of the King's Chapel Bell. Perhaps, the Singapore Bell weighed 1,608 pounds. Revere Bells generally sold for $.43 cents a pound, Maria's written correspondence suggested initially at least, that Joseph Warren Revere did not invoice his sister for the bell. We are hoping the National Museum of Singapore will confirm their bell's weight. ​ Singapore Infopedia, National Library Board. Archived from the original on 26 December 2014.